We like those kinds of questions, because we can get down to brass tacks and explore some of the concrete realities of implementing business intelligence in the banking industry. In many ways, it can be daunting to think about business intelligence in banking without feeling a little overwhelmed. Although there’s no shortage of software available out in the world that could help you, implementing business intelligence in banking still requires a deft hand – which makes OpsDog’s KPI-Driven Business Intelligence Services™ a natural fit for projects such as these. Our team is a well-oiled machine ready to take on any business intelligence in banking project. We’ve helped Fortune 1000 BI projects in different stages, and if you call us, we can help you get acquainted with the benefits of KPI-focused business intelligence in banking and implementing business intelligence in the banking industry. You’ve more than likely heard over and over about the benefits of implementing business intelligence in the banking industry. You’ve heard that as a collection of strategies and technologies, it will help you analyze vast swaths of data. But now that you’re ready to go a step forward and start implementing business intelligence in the banking industry, maybe you want a solid idea of what that looks like and specific examples of implementing business intelligence in the banking industry. In this blog, we hope to give you exactly that, as we take a dive into business intelligence in banking, which will include some insight into a business intelligence banking case study. A simple fact of life is that you can’t improve something unless you know how good or bad you’re doing it now. In much the same way, you can’t enjoy the full benefits of business intelligence in banking until you know exactly where you need to most start implementing business intelligence in the banking industry. Thankfully, this is one of the better chicken/egg scenarios, as the initial process of applying business intelligence in banking itself can help identify areas to improve. Many times, clients that come to OpsDog find that the first area they need to improve is the first step in any business intelligence in banking project, the data. Because business intelligence in the banking industry, indeed business intelligence, relies on data from so many internal sources, that data is almost always very messy and unsuited for use in business intelligence projects. You must seek out qualified, trained staff that can clean that data efficiently. Otherwise you could be looking at 80% of project time being taken up by the task. All of this may sound simple if you happen to already be familiar with business intelligence in banking, but the truth of the matter is, even experienced companies can get tripped up by this. This is mostly because the data that these companies’ business and IT departments are working with is being obtained in a vacuum. They don’t have sufficient experience with business intelligence in banking needed to get a handle on the most important data to consider is. While this is certainly not the fault of these professionals, it is an opportunity for growth and improvement that could lead to the true benefits of business intelligence in banking. The importance of business intelligence in banking goes beyond just the initial data roundup, of course. The biggest takeaway of a project in business intelligence in banking is arguably the resulting visualized reporting and the cleaned up ongoing business intelligence in banking data that is refreshed continuously behind the scenes. The resulting business intelligence in banking dashboard will help make clear what areas your bank needs to improve on. Meanwhile, the new data standards behind the dashboards will help banks focus on standardizing data on an ongoing basis. This is one of the less obvious benefits of business intelligence in banking. Your business intelligence in banking project will almost certainly keep working for you by fostering a standardized work process. And for an increasingly mobile world, the fact that these dashboards are easier to take on the go than your normal boring spreadsheets and graphs is just an extra point in an already large list of benefits of business intelligence in banking. Our team at OpsDog are fans of dashboards and making them the best they can be. We’ve helped clients from banks to logistics companies by developing user-friendly, interactive dashboards that not only have the data needed, but also look good while showing it. Give us a call if you need to optimize your own. We’ve discussed before the importance of KPIs, key performance indicators, to implementing business intelligence in banking. A quick refresher: without them, you can’t measure your business in a quantitative way that will point you in a direction to receiving the full benefits of business intelligence in banking. But it’s not enough to just say KPI and expect the right ones to appear out of thin air, you must choose the ones that work best for your goals in business intelligence in banking, in this case, increased productivity. When talking about business intelligence in banking, we find that most businesses worry about going through every single bit of data available in the company before even thinking about what they want to measure. This is backwards. You must understand what exactly it is you need to measure before you try to measure it. Don’t boil the ocean to find a sea shell. So, you have a broad goal, increase productivity, how do you choose which KPIs to use when implementing business intelligence in banking? It helps to have a clearer picture of what your options are, and that’s one area that OpsDog excels in. 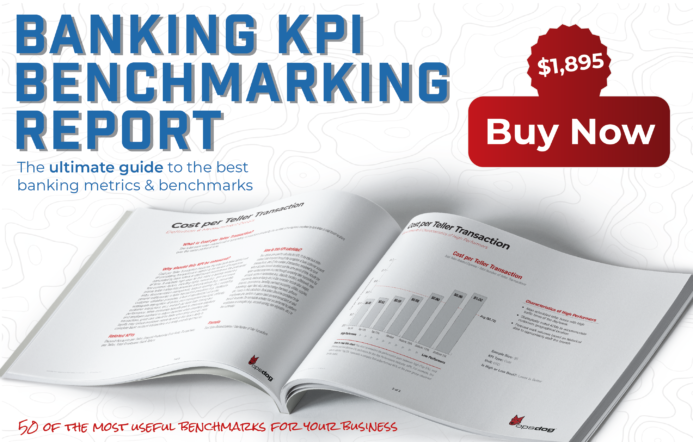 Our team has assembled the most industry specific KPIs on the planet, which you can find online. If those catch your eye, you can always contact us and we can share our expertise. Cost per Teller Transaction: Total teller-related cost of completed transactions divided by how many transactions are completed by tellers at bank locations over a period of time. A high number here could point to productivity issues concerning too many errors in manual processes, inefficiencies in transaction procedures and more. Teller Transaction Cycle Time: Average time, in seconds, it takes for a customer to complete a transaction with a teller, from beginning to end. Long or inconsistent times may reflect productivity issues such as ineffective technology, training programs, or lack of on-site aids. Total Deposits per Branch: Total amount, in dollars, of deposits managed by a bank divided by the number of retail banking locations managed by said bank. Productivity issues that could lead to a low number here include inefficiencies in account management processes and untargeted marketing and ad campaigns. These are but a few of the KPIs you’ll want to think about as you use business intelligence in banking to increase your productivity at the retail branch level. You can probably tell we’re passionate about it, and why not? We do this every day and know the benefits of business intelligence in banking. We’ve helped our fair share of retail banks in their business intelligence in banking projects. As you might imagine this has led to several instances where our work created the base for a business intelligence case study. As an example of the kind of business intelligence case study you can find from us, we’d like to talk about a bank we helped in their business intelligence in banking project. This top 50 U.S. bank needed, among other things, an assessment of their existing data as well as development of interactive dashboards to better serve and display their business intelligence project. When we say these are integral to implementing business intelligence in the banking industry, we’re not kidding. 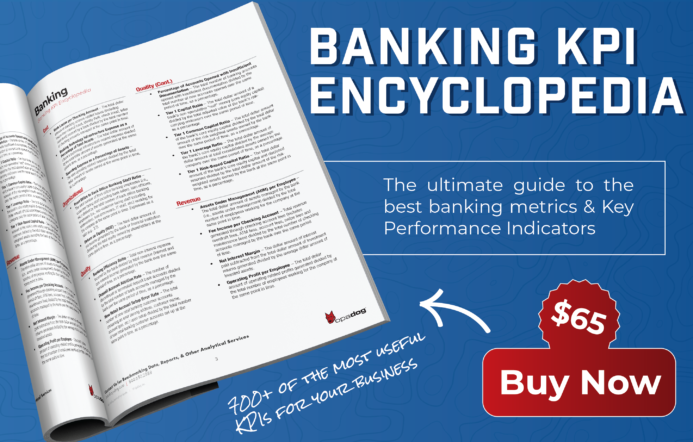 With our experience, we dug into the bank’s data and identified the KPIs that were most valuable in implementing business intelligence in banking. Using our cloud Power BI services, we also took their business intelligence in banking project further by creating several dashboards that expressed, clearly and definitively, data for the bank’s sales, loan processing and customer service organizations. Ultimately, all dashboards were published throughout the entire organization and easily accessible by management. They only had to log on to a business intelligence in banking reporting site set up by us through OpsDog.com. No technology implementation was needed on the client’s site. If you’d like to get a fuller picture of what we can do, contact us to see more case studies or just talk with us about business intelligence in banking and how we can help make it work for you. Work with us on implementing business intelligence in banking and see how we can show you the benefits of business intelligence in banking.